Don’t settle for taking the same vacation year after year; this year, resolve to visit a new destination! If you want to see some truly outstanding sights on your next adventure, choose to visit the magnificent Yosemite National Park in California! This area contains some of the most breathtaking views you’ve ever experienced, including gushing waterfalls, peaceful lakes, and towering mountain peaks. While you’re exploring this area, you might hear talk of something known as the Yosemite Firefall. Learn all about what the Yosemite Firefall is and how you can see it while you’re visiting this incredible gem of the West! What Is the Yosemite Firefall? The Yosemite Firefall was once a treasured tradition of locals in the Yosemite area. This tradition first began in the year 1872, when a local hotel owner built a massive bonfire on the edge of Glacier Point. He put out the fire by kicking the still-glowing embers off the edge of the colossal peak. Visitors down below spotted the orange embers tumbling down the side of the mountain and gazed in awe, as it looked like a massive waterfall of fire! This soon became a popular event- people traveled from far and wide to watch the fiery remains of a bonfire to trickle down Glacier Point in a glorious display. What Happened to the Yosemite Firefall? The Yosemite Firefall continued its shows for nearly 100 years. However, it was shut down in the year 1968. Officials declared the firefall was drawing too many crowds and causing damage to the park’s meadows. They also said that since the firefall was a man-made spectacle, it wasn’t fitting for the national park- it was better suited for an amusement park. What Is the Yosemite Natural Firefall? While the man-made Yosemite Firefall no longer exists, you can still see the Yosemite Natural Firefall! During just two weeks in February, the setting sun hits the Yosemite Horsetail Fall at the perfect angle, causing it to glow a fiery orange hue! This is truly a spectacular sight like none other. Where Is the Best Place to Stay During a Trip to Yosemite National Park? The Yosemite Natural Firefall is only visible for a brief time during February, so start making your travel plans today! You’ll need a place to stay while you’re here, so be sure to book the finest accommodations possible! 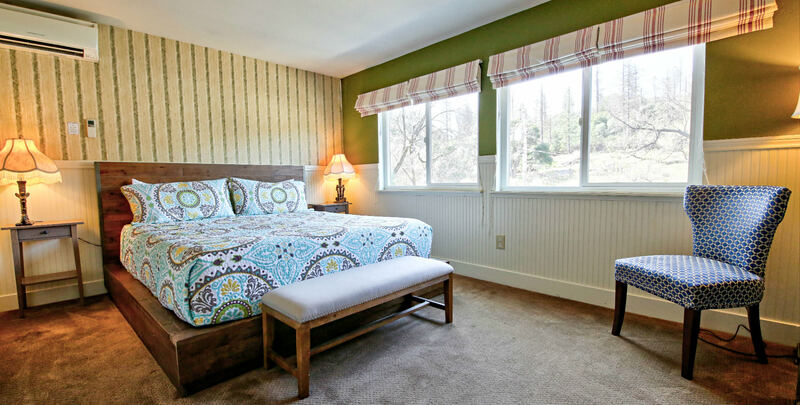 Hotel Charlotte is a historic bed and breakfast in Groveland, California, just minutes from Murphys, that offers luxurious lodging and amazing amenities. Choose from staying in one of our twelve lovely rooms or renting one of our cozy apartment rentals. You can explore the many attractions of our surrounding town of Groveland, adventure through the magnificent Yosemite National Park, or simply spend time in our peaceful environment; we have a beautiful living room, friendly and helpful staff, and even our very own Fork and Love Restaurant to accommodate all of your needs! Don’t wait another minute to start planning your dream vacation; check our availability and book your stay today! To learn more about the many things to do in Yosemite, such as viewing the rare Yosemite Natural Firefall, download our free Vacation Guide!